Just as a warning for anyone looking at fish for a planted aquarium, don't trust what you read in terms of fish and whether or not they will eat plants. I have some Rummynose Tetras in a planted aquarium and couldn't figure out why my Hemianthus Callitrichoides wasn't growing until I took a closer look and realized that it was being eaten. 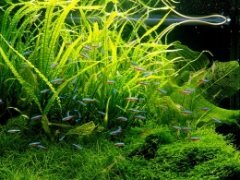 I couldn't understand why...I'd never heard of tetras eating a plant before, until I asked around online and found out that they do eat smaller leaved plants, like Glosso and HC. Up until now, I'd believed that only Silver Dollars and some hungry Plecos would eat plants. Since then I've been feeding them much more and they seem to be leaving the HC alone. So just as a word of caution, keep your fish well fed, even if they aren't supposed to eat plants, as they may discover they're a tasty snack. Red Eye tetras, also known as Lamp Eye tetras will eat plants. Mine like the new leaves emerging from my Anubias, only the tips of new shoots and not mature leaves. It pisses me off. I couldn't figure out why the new leaves were ragged and had holes in them as they got bigger until I observed them doing this. I recently planted some Broad Leaf Ludwigia Repens. I decided to not feed my heavily stocked tank today, trying to cut down on all the fish waste. Bad mistake! They went to town on the Ludwigia. I also have some Rummy Nose. They could be the culprit as well. I think the Lamp Eyes have to go, I have more then enough fish.